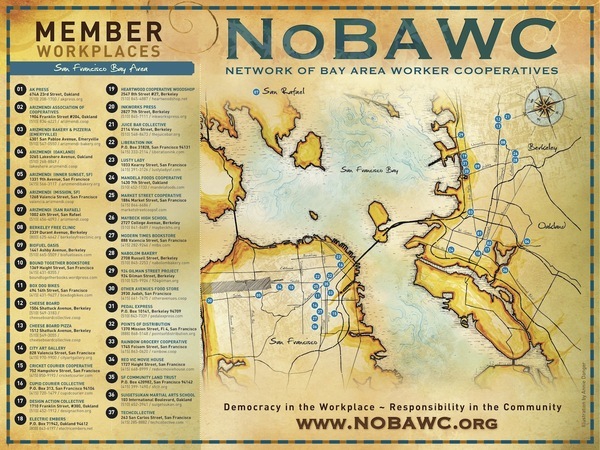 This beautiful 2011 map of worker co-ops in the Bay Area suffers from a lack of updatability. Can We Dodge the Dead-Ends? It’s easy to see the need for better ways of gathering, maintaining, displaying and using information. Without up-to-date information, the public misses out on patronizing otherwise worthy enterprises, it's harder to organize the social and educational gatherings that build community, public officials don't form an accurate picture of the strength of our presence, and organizers aren't aware of their counterparts who can teach them valuable lessons. But the tasks that go into creating useful directories are tedious, expensive (in time, money, or volunteer energy) and, though valued, rarely paid for. Less clear is how to turn the situation around. Despite our professed belief in collaboration and cooperation, we're as subject to the sway of proprietary, hierarchical culture as anyone. We place our hope in One Site To Rule Them All, that will be the destination, and arbiter, for all things Co-op. Or all things New Economy. Or all things Generative. Or all things Solidarity. Or all things Workplace Democracy. Or... uh-oh. Remember Venn diagrams? Those intersecting circles that show how groups overlap? The reality is that no circle is ever going to encompass all the great enterprises that are making the world a better place, in just the particular way that interests some of us. The Data Commons embraces the diversity of approaches and viewpoints toward creating a more rooted, equitable, cooperative and democratic economy. We want to facilitate collaboration and information-sharing among all the participants in that economy. The Data Commons Cooperative believes that information about the economic activity we want to see should be produced and consumed in as caring, creative, collaborative, and democratic a way as the economic goods and services themselves. Labor should be valued. The invisible support structure should be seen. Relationships should be among equals, regardless of means, with shared responsibility and shared benefits. How does the Data Commons make this vision manifest? The Data Commons Cooperative enables its members to share the information we each need to create a more democratic economy. DCC is a network owned and controlled by its members; each member contributes what they know and any member can use that data for their needs. By providing democratic access to information, DCC helps reduce costs and redundancy, and strengthens our movement by creating tools and facilitating projects that augment our members’ work. We have a sliding-scale dues structure, with dues waived for members that are low/no-budget grassroots groups. All of the tools that we create—for mapping and keeping track of listings, for example—are open-source, both using and adding to the store of common wealth. We bring together local groups—those with a focus on cooperatives, such as the Philadelphia Area Cooperative Alliance, as well as those with a focus on solidarity economics, such as SolidarityNYC—with larger umbrella organizations that represent whole sectors or larger geographies. Using the principle of reciprocity, we reward sharing with sharing. Rather than imposing a central repository and architecture, we're building a distributed network with flexible definitions. The vision still has a ways to go. It should be the case that when the ECWD wants to send out invitations to its 2015 conference, it can easily draw from national directories such as that of the US Federation of Worker Cooperatives, as well as local ones such as Cooperative Maine. Similarly, when the Manchester Food Co-op start-up wants to reach out to all New Hampshire cooperatives for support, that information should be available. Then, as those groups (inevitably!) find errors or updates, they can feed that new information back, and everyone benefits. The Data Commons is building the infrastructure for that kind of information flow, piece by piece. Eventually, anytime anyone puts effort into finding out about the cooperative and solidarity economy, we’ll all be richer for it. The Data Commons can make regional organizing easier, cheaper, and more effective—but we are going to need that collaborative spirit. We are now fundraising to jumpstart our next big push. With a matching grant from Fund for Democratic Communities, any donation of $100 or less from individuals is automatically doubled. Think of the joy when things just work (or, if you'd rather, the pain when they don't). With a strong Data Commons, instead of toiling over trivia, we can spend our time building the power of our grassroots economy. Nerdy, yes—but also necessary. The draft vision of the Data Commons Cooperative is “to be a critical catalyst for collaborative, generative, distributed flows of data in service of a collaborative, generative, distributed economy.” Our draft mission is “We build free and open infrastructure for members to collaboratively gather, share, maintain, display and deploy information about a generative economy.” Go to datacommons.coop to learn more, donate, or apply for membership. Noémi Giszpenc is the Secretary of the Data Commons Cooperative and a member of the operations team. 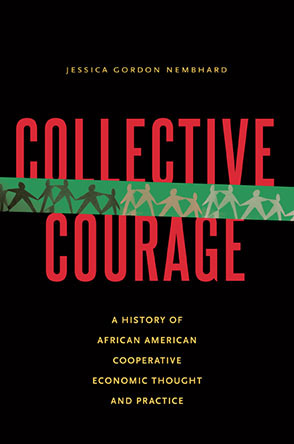 Noémi is also the executive director of the Cooperative Development Institute. Can co-ops help keep our data in the right hands?